An imaginative young girl makes a new best friend—an invisible yeti! Abigail is a nine-year-old with a huge imagination but when she and her dad move to a small town, that imagination only makes it harder to fit in at her new school. All that changes when she meets a loveable and sophisticated yeti named Claude who has escaped a top secret government facility. Abigail and Claude quickly become best friends, even if no one believes that he’s real. The fun can’t last and it’s not long before the mysterious Shadow Men chasing Claude are hot on his trail. To keep him safe from his former captors, Abigail and Claude embark on a great adventure to find his real home, but it might not be exactly where they expected. Eisner and Harvey Award-winning cartoonist Roger Langridge (Thor: The Mighty Avenger, Snarked) takes readers on a heartwarming journey of loyalty and friendship. 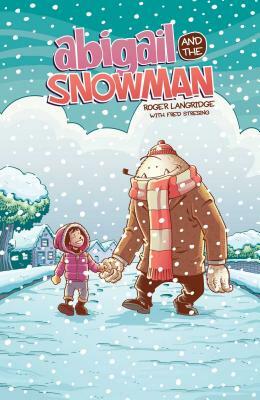 Roger Langridge has been producing comics for over twenty years. Most recently, he won an Eisner Award for his original series, Snarked, in 2013. He has attracted critical attention for his work on the Harvey Award-winning THE MUPPET SHOW COMIC BOOK (BOOM! Studios) and THOR: THE MIGHTY AVENGER (Marvel Comics); other works of note include Marvel's FIN FANG FOUR, Fantagraphics' ZOOT! and ART D'ECCO (in collaboration with his brother Andrew), and the NCS, Ignatz, Eisner and Harvey Award-nominated comic book FRED THE CLOWN. He currently lives in London with his wife Sylvie and their two children.